The series of 20 postcard sized images that follow were published in 1946 in Buenos Aires, Argentina. Selecting the image [right] will take you to the next image. Use the arrows to go forward or back. Each grim image is printed on thin paper rather than on a stiffer board that would better withstand a trip through the postal system. 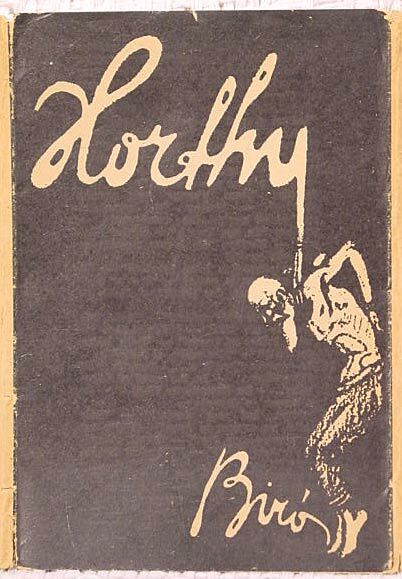 The image [right] appears on the wrapper, and is simply titled 'Horthy'; an aged victim of extensive torture hangs from the descending Y; the artist's signature springs from the foot of this dead or dying man. Printed on the inside of the wrapper in Hungarian, French, English, Spanish and German, is the title of the series, The White Terror in Hungary During the Regime Horthy, along with accompanying captions for each of the 20 images. Admiral Miklós Horthy was head of a right wing, anti-Communist, often anti-Semitic counter-revolutionary government that controlled Hungary from 1920 through the end of World War II. La primera edició de esta serie de dibujos fué hecha en 1920 en Viena por Michael Biró. Durante el ré Horthy y nazi las autoridades fascistas destruyeron en Europa todos los ejemplares existents de esta obra. Ces dessins ont été executés sur des faits acusés dans le rapport de la Commission Parlamentaire britannique. ** "The Wedgewood Report (named after the British labor representative J. C. Wedgewood) was the report of a commission which was invited by the Hungarian government to weaken the reports about the atrocities in Hungary (according to the government's ideas). The commission, however, was successful in shedding some light into this dark affair, largely due to the testimonies given by the emigrants in Vienna." Based on all possible sources and authentic reports, Biró created his 'Drawings of Horror.' With these 20 sheets, he incurred the fury of the Horthy regime. In Vienna, where Biró was living and working at the time, and following protests from the Hungarian Embassy, the drawings were banned from public display. from the book by Emil Horn, Mihály Biró, PlakatKonzepte, Hannover, 1996.